This article is a short summary of Fire Emblem: Shadow Dragon. Fire Emblem: Shadow Dragon is a Nintendo DS remake of the Japan-exclusive Famicom title Fire Emblem: Shadow Dragon and the Blade of Light, and regarded as the eleventh installment in the Fire Emblem series. The game was released in August 2008 in Japan and was later released worldwide in 2009, making it the first release of Shadow Dragon and the Blade of Light outside of Japan. Assemble and army and use your strategy to outsmart and outfight the forces of darkness. Position your archer to rain arrows on your foes, or charge full-speed into the enemy flank with a Cavalier! The all-new prologue introduces you to the art of war and sets the stage for Prince Marth's battle to free his stolen homeland. 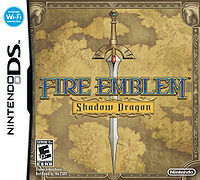 Fire Emblem: Shadow Dragon retains most elements of the original game. One of the new gameplay elements is the addition of an optional four-chapter prologue featuring new characters, as well as adding "Gaiden" chapters, extra side-stories that primarily allow players to recruit new characters. Series standard features introduced in titles following the original game, such as the weapon triangle, separate Strength and Magic stats, and the combat forecast, have been implemented. Gameplay makes use of both screens, the top screen showing battles and character statistics while the bottom screen is used to move characters across the grid-based map. Players can save their game after every battle, or by reaching a single-use save point in every chapter. Shadow Dragon is the first title in the series to incorporate online play in addition to local wireless multiplayer. Two players can battle each other with five of their units to either defeat the enemy team or complete a certain objective first. Players can also loan out units to other players for in-game currency, and players who have exchanged Friend Codes can use voice chat. EU/AUS: July 2, 2015 A direct port of the game released as a digital download on the Nintendo eShop for Wii U, with added Virtual Console emulator features. This page was last edited on 25 September 2017, at 21:38.